I have heard (I'm not sure how valid it is) that EPROMs could be erased by exposure to UV light. My professor had mentioned it in my Microprocessor Design class; however, I'm not sure if he's bluffing or not. Can anyone verify if this is true? 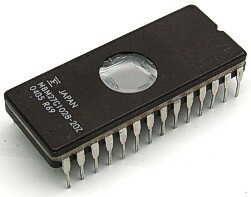 If so, how long does it take to erase the chip, and why would one do it this way instead of erasing the chip through a programmer like it can be done today? EDIT: My professor did in fact say EPROMs. Are you sure the professor wasn't referring to UV-erasable EPROMs, like they were used until the 90's of last millennium? You do mention EPROM, not EEPROM. The erasure characteristics of the M2732A are such that erasure begins when the cells are exposed to light with wavelengths shorter than approximately 4000 Å. It should be noted that sunlight and certain types of fluorescent lamps have wavelengths in the 3000-4000 Å range. Research shows that constant exposure to room level fluorescent lighting could erase a typical M2732A in approximately 3 years, while it would take approximately 1 week to cause erasure when exposed to the direct sunlight. If the M2732A is to be exposed to these types of lighting conditions for extended periods of time, it is suggested that opaque labels be put over the M2732A window to prevent unintentional erasure. 254 nm is in the UV-C band, and most of the sun's UV-C is filtered in the stratosphere. That's why it will take up to a week to erase all 32 768 bits of the 2732 in direct sunlight, though the first altered bits may occur much faster than that. Like the datasheet says you don't even need sunlight. Leaving an EPROM on your desk under a fluorescent desk lamp without protective sticker will have the first bits erased within days. To erase all bits you might need more than a year however, depending on how close the lamp is to your desk. Since you seem to be talking of EEPROMs, i.e. the window-less: yes, those can also be "erased" by sunlight. I'm putting erased between quotes, because I would rather say "altered". In direct sunlight (stand on a chair to be closer to the sun) some of its energy may penetrate through the package to the charge on the floating gate, giving some of it enough energy to tunnel through the isolation barrier. After some time (years) you may see that some bits altered state. But in practice it's impossible to erase a whole device this way. I said "tunnel through the isolation barrier", and that's how it's usually said. But as far as I understand quantum mechanics (not much) that should be "tunnel to the other side of the isolation barrier", not "through" it. We used to use sunlight erasing with good success. 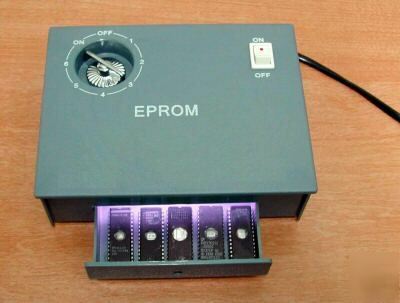 In the late 1970s we found that on a reasonably sunny day a batch of "windowed" EPROMs exposed to sunlight for a day on a sunny windowsill through glass with the EPROM horizontal would invariably erase reliably. We probably had some idea of how little time it took but it was no so long ago that such fine detail escapes me. Note that the erasing was with light passing through standard window glass (a reasonable UV filter), and the EPROMs were placed flat, so were being irradiated at an angle to the optimum angle. However, this was in New Zealand which has a higher UV level than most other countries. [If you expose unprotected skin to say 2 to 4 hours full sun here in midsummer you can expect extremely severe and painful burns with the possible need for medical treatmemnt.] One hour will often leave you sore and sorry the next day. A word of caution - ESD damage: The windowsill used was smooth stone. We found that we were getting a significant number of complete IC failures after erasing when the EPROMs were placed directly on the stone sill. By erasing them either on an aluminum sheet or embedded in electrically conductive foam the failure rate dropped to zero. We surmised that the warm dry conditions on an insulating surface were providing an ideal environment for electrostatic damage either during erasing or subsequently. This is by far the most repeatable and clear cut case or ESD damage and prevention that I have met. People are wrong on the internet - again: Note that the large majority of internet references to required erasure times for EPROMs are wrong. Times mentioned typically range from days to weeks. We were using "large " :-) 28 x 8, 2716 single supply EPROMs or newer/larger ones. We would have had 3 supply 2708 and 2716 but these had largely been superseded by then. No, your professor is not bluffing. EPROMS certainly can be erased by exposure to enough sunlight although it is hard to give a precise erasure time since sunlight levels vary. One would not choose to erase devices in this way so EPROM windows were covered by UV-opaque paper labels to prevent this from happening by accident. In high reliability applications (eg avionics), aluminium labels were glued over the windows. UV-EPROMS can only be erased by exposure to UV light so EPROM erasers were manufactured for this purpose. These erasers contained one or more UV tubes and a timer. 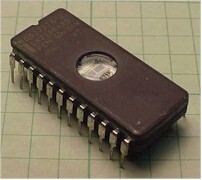 EPROMS were placed in a drawer which was then closed and the timer set for 20 or 30 minutes, after which time the devices were completely erased. It was not possible to erase them electrically using a device programmer. These days, EPROMS are rarely used since electrically eraseable technologies have almost entirely replaced UV eraseable PROMS. This versions were obviously a little bit more expensive and only used during prototyping, in the final products the chips would have no glass window. In those days a chip eraser (basically a small box with UV tubes and a timer) would be used to reliably erase all the bits in several minutes. But why all the hassle? Because the technology to remove charges from the floating gate of a transistor other than through UV light was not available. This answer applies to EEPROMS. For EPROMS see other answers. No - EEPROMS as commonly available cannot be erased with sunlight. The exception is if you use a magnifying glass to concentrate the sunlight. In that case it erases them so effectively that they have a Thiotimoline like effect - they stay erased on all future occasions even when subsequently programmed. It is believed that exposure to sunlight from LSO (low Solar Orbit) has a similar effect but this has not yet been tried. 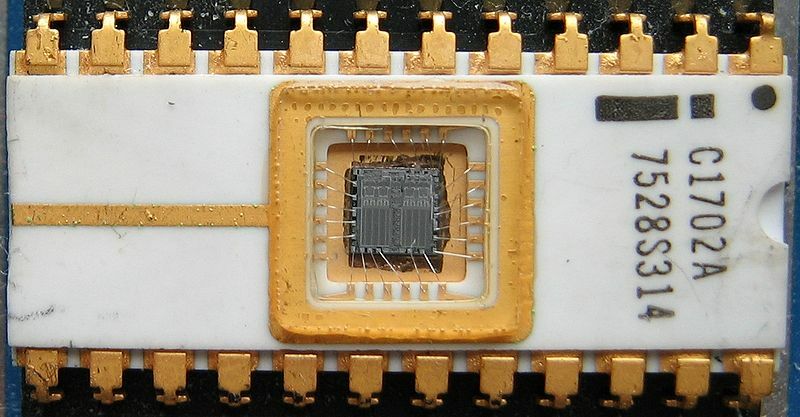 DIE eeproms can easily be erased by a UV EEPROM eraser, without the "programming voltage, the UV creates enough conductivity for the device charge to be bled off. To erase a eprom by sunlight takes long time. Takes longer if you have vapor (humidity) in the air, or low above the see level, like Florida. There is a easy way to do it, break the outside glass of a mercury vapor light, you will get a lot of UV radiation, but NEVER!!! look in to that light. How to communicate with parallel eeprom with pic18f? Why is so8 test clip causing read errors with 93C56 eeprom (TL866 programmer)?